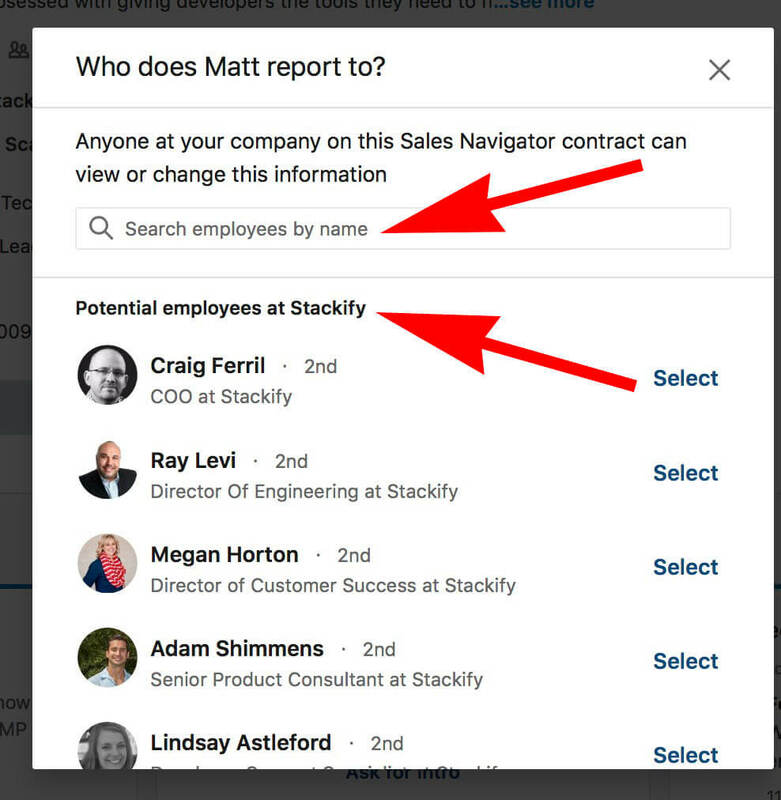 In the Fall of 2018 Linkedin released a new Sales Navigator feature called “Reports to” which allows you to designate who manages that individual. 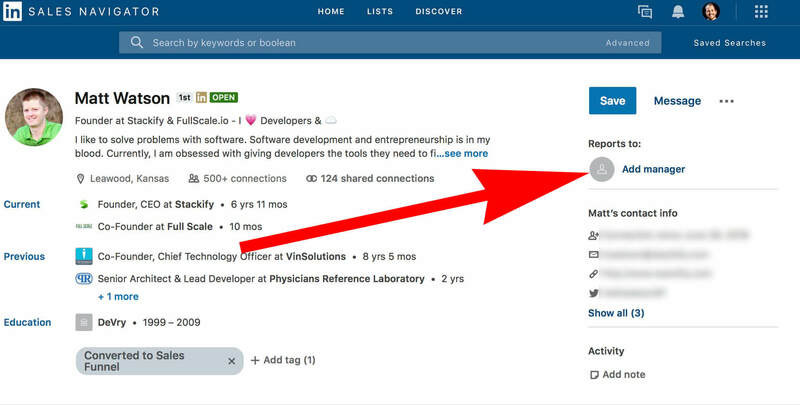 This is one small step in Linkedin’s efforts to make Sales Navigator a more robust CRM. Let’s talk about the benefits it brings, where it is, and how to use it. Adding a manager does two things. It helps you (and your sales team) chart and remember who manages who and creates a clickable shortcut from one connection to another. It’s a user interface improvement because it saves you time going from one person to the next. It also promotes engagement with the right people. It’s a win-win. This is something that you’ll only see on Sales Navigator and is located on the far right side of a profile. You can add this information whether or not you are connected. 1) Search employees by name (this can actually be any person on Linkedin regardless of their current employer). 2) Scroll through the list of employees who have the same company page on their profile. 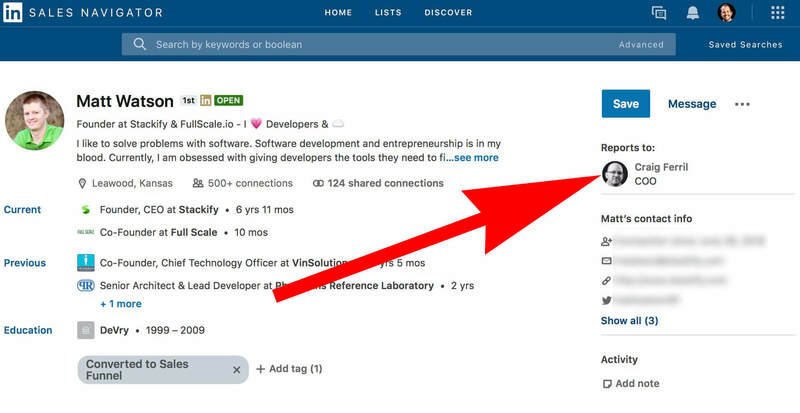 After adding a manager you can easily move from one profile to the next. This becomes very convenient when having a dialogue with multiple people in the same company. Who can see added managers? Only you and your Sales Navigator team can see your added managers. It is not public information. It may, however, be used by Linkedin for other reasons they have not yet disclosed.